Wood Panels: Dino - might! So... firstly, yes, it has been a VERRY long time since my last confession... er... submission. This is actually one of three I did over the last couple of days. I might try to post all of them here, 'cause actually I think something pretty magical? amazing? fun is happening here. I'm really quite proud of this one. 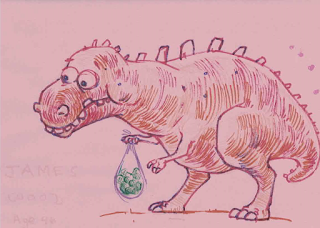 This is a goofy, concerned sort of dinosaur holding a bag of brussel spouts. Why brussell sprouts?! Well who doesn't love them, especially at Thanksgiving? Maybe that's why he's concerned - He's not sure everyone will like his brussel sprouts. And why do I love this drawing? A bunch of reasons really. One, I just had fun doing it. If you have a chance to do some drawing with a kid, take the time and do it. When doing this in the company of a five year old, my imagination was stretched, my creativity pushed, and I had the time to start and kept adding to and adding to the drawing - I realize the last part may not be possible when drawing with five year old! AAAAnyway, believe it or not, this one took me over an hour to do! 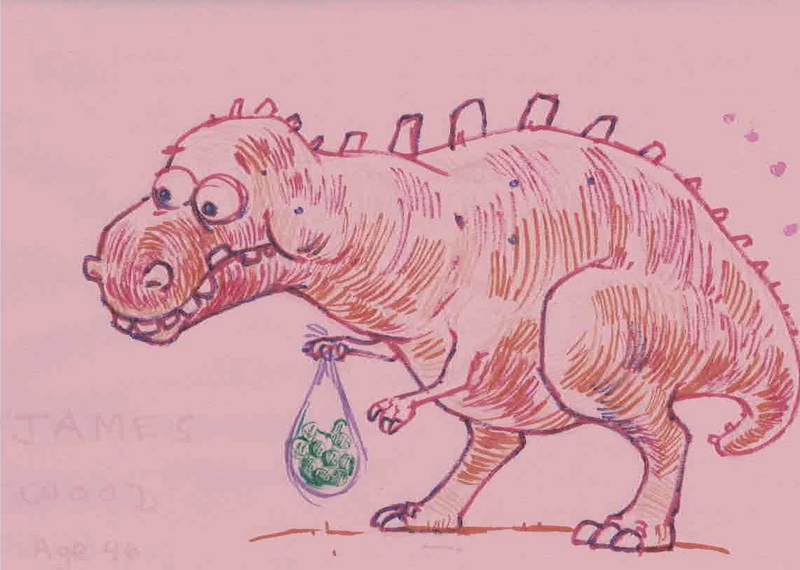 I used that time to add the rendering lines that define the dinosaur's form - and I think that is one of the best parts of this drawing - how the form was rendered and that it actually looks rounded. Another thing I really like is the various colours. I could have done it all with a pink Crayola marker, but instead I kept adding form lines with various colours - reds, oranges, yellows, and purple as an outline colour. It was drawn on pink construction paper with Crayola markers - great texture. Every time I find myself drawing with low tech - kid friendly, probably non-archival quality materials I really enjoy the tactile experience of using the materials and come out with something worth keeping. I guess this one was just inspiring, not necessarily as a "this is a great concept, and I can do x and y with it! ", rather it was inspiring because I was and am inspired to do more drawing. Doing this energized me to do more. There are a bunch of reasons to like this. The colours and the rendering lines are great and the guy has real shape and he's in perspective and that ain't easy to do. The real reason I like this is the character of the Dino. Everything about him - from his expression to the pose of his tentative arms - looks gentle and concerned and careful. The way the bag of Brussel sprouts hangs there - everything really - everything reinforces the personality of this very likeable creature. Nobody, but NOBODY likes Brussel sprouts.